A fiery journey to Sufism’s golden age of spiritual expression through poetry. To fully experience the ecstatic poetry of the Middle and Near East, you must hear it as originally intended: stirred ablaze by inspired music and rhythms before a live audience. 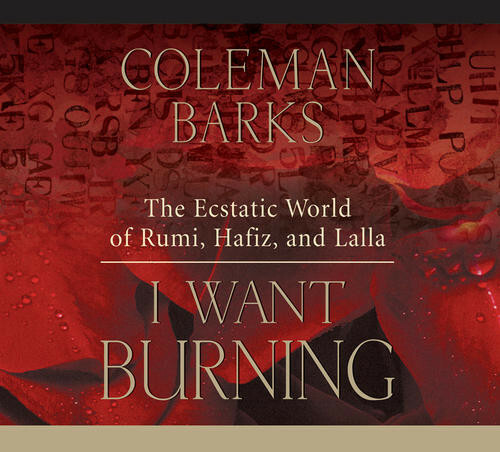 On I Want Burning, Coleman Barks fuses his passionate scholarship with a deep feeling for the poetry of Rumi, Hafiz (a 14th-century Sufi mystic, called “one of the jewels in the necklace of Persian poetry”), and Lalla (an exquisite Kashmiri female poet of the 14th century). Includes more than 50 translations of this rare and moving work, accompanied by vocals, Peruvian flute, harmonium, and other instruments. The day I heard you speak at Frostburg State University many years ago, I knew nothing about Rumi. My search began on that day and I am grateful that Rumi is a living spirit for me and always will be. This is a stunning and mystical experience ... a live evening of sacred poetry accompanied with music of the genre and background history on spiritual giants like Rumi, Attar, Lalla and the rest. I was utterly blown away by the depth and the quality of the experience delivered here.